Love To Organize? The Art From Scrap Creative Reuse Store Is Looking For You! Are you interested in helping the environment? Do you want to learn more about reuse and waste reduction? Do you support creativity and the arts? Do you see the potential in reuse materials and love turning trash into treasure? If you answered yes to any of these questions, this is the volunteer opportunity for you! 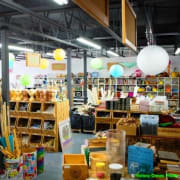 The Art From Scrap Creative Reuse Store is looking for some great volunteers to work in our retail store: stocking, sorting, organizing materials, and assisting staff. You can "adopt" a section of the store to maintain and stock weekly or help out when your schedule permits. Volunteer hours for this opportunity are Thursday and Friday 2:00 pm to 5:00 pm and Saturday and Sunday 11:00 am to 3:00 pm. Art From Scrap is a program of Explore Ecology, an environmental education and arts nonprofit located in Santa Barbara, CA.